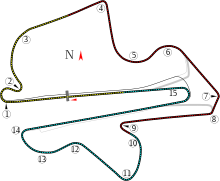 The 2009 Malaysian Grand Prix (formally the XI Petronas Malaysian Grand Prix) was a Formula One motor race held on 5 April 2009 at the Sepang International Circuit in Sepang, Malaysia. It was the second race of the 2009 FIA Formula One World Championship. The race was due to be contested over 56 laps, but was stopped after 31 laps due to torrential rain. Jenson Button, driving for the Brawn GP team, was declared the winner, having started from pole position. Nick Heidfeld was classified second for BMW Sauber with Timo Glock third for Toyota. As the race did not reach the required 75% distance (42 laps) for full points to be awarded, half-points were given instead, for only the fifth time in Formula One history and the first since the 1991 Australian Grand Prix. The race distance of 171.833 km (106.772 mi) was the fifth-shortest ever covered in a World Championship Grand Prix. Brawn GP became only the second constructor to win their first two World Championship Grands Prix since Alfa Romeo won the first two ever, in 1950. On the Thursday before the race, Lewis Hamilton was disqualified from the preceding Australian Grand Prix for misleading the stewards. After winning the season-opening Australian Grand Prix held one week earlier, Jenson Button led the Drivers' Championship by two points from his teammate Rubens Barrichello and by four points from Jarno Trulli. His teammate Timo Glock was fourth and Fernando Alonso completed the top five. Brawn GP led the Constructors' Championship by 7 points from Toyota and by 14 points from Renault. Williams and Toro Rosso were fourth and fifth. The race start time was moved forward two hours, from 15:00 local time (07:00 UTC) to 17:00 local time (09:00 UTC). However, the organisers turned down the possibility of holding a night race, in line with the 2008 Singapore Grand Prix, for budgetary reasons. "This morning we had a problem with the KERS, which cost us a bit of time, but we managed to make up for most of it in the afternoon. We had felt that the situation here could be different to Melbourne, but it is still too early to say where we are up against the opposition. What we can be sure of is that when the car runs trouble-free, we are competitive. We hope we can do a good job in tomorrow's qualifying." Kimi Räikkönen, after his incident in the first practice session, and after setting the fastest lap in the second practice session. Jenson Button took his second pole position of the season for Brawn GP. Three practice sessions were held before the race; the first was held on Friday morning and the second on Friday afternoon. Both sessions lasted 1 hour and 30 minutes with weather conditions dry throughout. The third session was held on Saturday morning and lasted an hour, and was also dry throughout.Nico Rosberg and Kazuki Nakajima secured a Williams one-two in the first session with times of 1:36.260 and 1:36.305 minutes respectively. In the second session, Ferrari's Kimi Räikkönen and Felipe Massa went quickest with times of 1:35.707 and 1:35.832 minutes. After 18 laps, Räikkönen's cockpit began to billow out smoke, and though Ferrari did not give an official statement, there are reports that the car's kinetic energy recovery system (KERS) had overheated. Jenson Button took Brawn's second consecutive pole ahead of Jarno Trulli's Toyota. Rubens Barrichello qualified fourth in the other Brawn (third when Vettel's penalty was taken into consideration), but was demoted five places to eighth after a gearbox change. An error in strategy meant that Massa failed to make it through Q1. In an interview to Rede Globo, the driver said that he and the team thought the initial time posted was enough to qualify for the second session, and refrained from recording additional times to spare the car's engine. However, this was not the case, and Massa was left in 16th place. Jenson Button took pole position on the starting grid, but Nico Rosberg (in fourth place) made the best start and led for the first time in his career, into the first corner. Robert Kubica retired on the second lap when his engine failed. Off the line, there was a clean getaway by all drivers, apart from Robert Kubica, who was forced to retire from engine problems after the first lap. Williams' Nico Rosberg moved from fourth on the grid to lead into the first corner, followed by Jarno Trulli and Fernando Alonso, who had used his KERS system to good effect to move up from tenth; Jenson Button made a poor start in his Brawn and was down to fourth. Heading into turn five, McLaren's Heikki Kovalainen ran wide onto the track's 'marbles' (fragments of degraded tyre rubber), and spun into early retirement. By lap 19, rain had started to fall and most of the drivers pitted for wet tyres. However, at this stage there was no standing water on the track, and so the wet tyres started to wear out very quickly. Timo Glock had been using intermediate tyres which were better suited to the conditions and moved rapidly up to third place. The other drivers followed this example and switched to intermediate tyres as well, which the majority of the field stayed on until lap 31 when the downpour finally reached the whole track, and drivers pitted for wet tyres once again. The conditions were proven to be so treacherous that Sebastien Buemi and Sebastian Vettel (who was in 8th position) had both spun out into retirement by lap 31 despite them being on the wet tyres right before the race was stopped. Due to the torrential rain, the race was stopped on the 33rd lap and the results were taken from the classification at the end of lap 31 (the penultimate fully completed in accordance with sporting regulation 42.8). Half-points were subsequently awarded to the top eight. Button took his second victory of the season and five points, and it was the first time he had won back to back victories and his third career victory. The victory also meant that Brawn GP became the first team since Alfa Romeo in 1950 to win their first two Grands Prix. Nick Heidfeld was classified second ahead of Toyota's Timo Glock. Heidfeld was the first driver to take a podium position with a KERS-equipped car. Trulli, Barrichello, Hamilton and Webber stop their cars on the start-finish straight following the decision to red-flag the race. Crowd members leaving the stands after the race was abandoned. The drivers generally backed the decision to abandon the race, citing diminishing visibility (due to the later starting time) as well as the heavy rain. Mokhzani suggested the possibility of implementing a lighting system (similar to that used in the Singapore Grand Prix) to illuminate the circuit in future races. Cars that used the KERS system are marked with "‡"
^1 Sebastian Vettel received a 10-place grid penalty for causing an avoidable accident involving Robert Kubica at the Australian Grand Prix. ^2 Rubens Barrichello received a 5-place grid penalty for a gearbox change. Scheduled for 56 laps but stopped early due to heavy rain. Half points awarded. The race was only the fifth in Formula 1 to be abandoned before 75% distance: the others were the 1975 Spanish and Austrian Grands Prix, the 1984 Monaco Grand Prix and the 1991 Australian Grand Prix (the shortest Grand Prix ever). ^ "Malaysian Grand Prix – Preview". Fédération Internationale de l'Automobile. 1 April 2009. Archived from the original on 6 April 2009. Retrieved 4 April 2009. ^ Baldwin, Alan (5 April 2009). "Button wins Malaysian GP cut short by rain". Reuters. Thomas Reuters Corporate. Retrieved 5 April 2009. ^ a b Gorman, Edward; Lumpur, Kuala (5 April 2009). "Jenson Button wins abandoned Malaysian Grand Prix". Times Online. London: Times Newspapers Ltd. Retrieved 5 April 2009. ^ "Statistics: Kms, The less". statsf1.com. 5 April 2009. Archived from the original on 30 July 2009. Retrieved 5 April 2009. ^ a b c Whyatt, Chris (5 April 2009). "Classy Button wins abandoned race". BBC Sport. BBC. Archived from the original on 7 April 2009. Retrieved 5 April 2009. ^ a b "2009 FIA Formula One World Championship - Drivers Provisional Classification". Fédération Internationale de l'Automobile. 5 April 2009. Archived from the original on 30 July 2009. Retrieved 5 April 2009. ^ "Friday practice – selected team and driver quotes". formula1.com. 3 April 2009. Archived from the original on 6 April 2009. Retrieved 5 April 2009. ^ "2009 Formula One Sporting Regulations" (PDF). FIA. 24 March 2009. Archived from the original (PDF) on 7 April 2009. Retrieved 5 April 2009. ^ "Raikkonen tops Malaysia practice". BBC Sport. BBC. 3 April 2009. Archived from the original on 6 April 2009. Retrieved 3 April 2009. ^ "Button storms to pole again in Malaysia". ITV F1. ITV plc. 4 April 2009. Archived from the original on 5 April 2009. Retrieved 27 January 2016. ^ a b "Barrichello gets 5 place penalty". autosport.com. Haymarket Publications. 3 April 2009. Archived from the original on 30 July 2009. Retrieved 3 April 2009. ^ "Erro de estratégia deixa Massa em 16º" [Strategy error leaves Massa in 16th]. GloboEsporte.com (in Portuguese). Rede Globo. 4 April 2009. Archived from the original on 30 July 2009. Retrieved 5 April 2009. ^ "Massa admits qualifying error". BBC Sport. BBC. 4 April 2009. Retrieved 5 April 2009. ^ a b c Cheese, Caroline (5 April 2009). "Malaysian Grand Prix as it happened". BBC Sport. Archived from the original on 2 March 2019. Retrieved 2 March 2019. ^ a b c d Hughes, Emlyn; Creighton, Geoff (5 April 2009). "As it happened: Race day at Sepang". Autosport. Archived from the original on 7 April 2009. Retrieved 2 March 2019. ^ "2009 Formula One Sporting Regulations" (PDF). 2009 Formula One Sporting Regulations. Fédération Internationale de l'Automobile. 24 March 2009. Archived from the original (PDF) on 7 April 2009. Retrieved 27 January 2016. If the race cannot be resumed the results will be taken at the end of the penultimate lap before the lap during which the signal to suspend the race was given. ^ "Drivers back Malaysia abandonment". BBC Sport. BBC. 5 May 2009. Archived from the original on 8 April 2009. Retrieved 5 May 2009. ^ a b "Malaysia start time under review". BBC Sport. BBC. 6 April 2009. Retrieved 6 April 2009. ^ "2009 FORMULA 1 PETRONAS MALAYSIAN GRAND PRIX - Qualifying Results". formula1.com. Retrieved 12 September 2018. ^ "Vettel gets 10-place grid penalty". BBC Sport. BBC. 29 March 2009. Archived from the original on 1 April 2009. Retrieved 3 April 2009. ^ "2009 FORMULA 1 PETRONAS MALAYSIAN GRAND PRIX - Race Results". formula1.com. Retrieved 11 September 2018. ^ a b "Malaysia 2009 - Championship • STATS F1". www.statsf1.com. Retrieved 19 March 2019. Wikimedia Commons has media related to 2009 Malaysian Grand Prix.